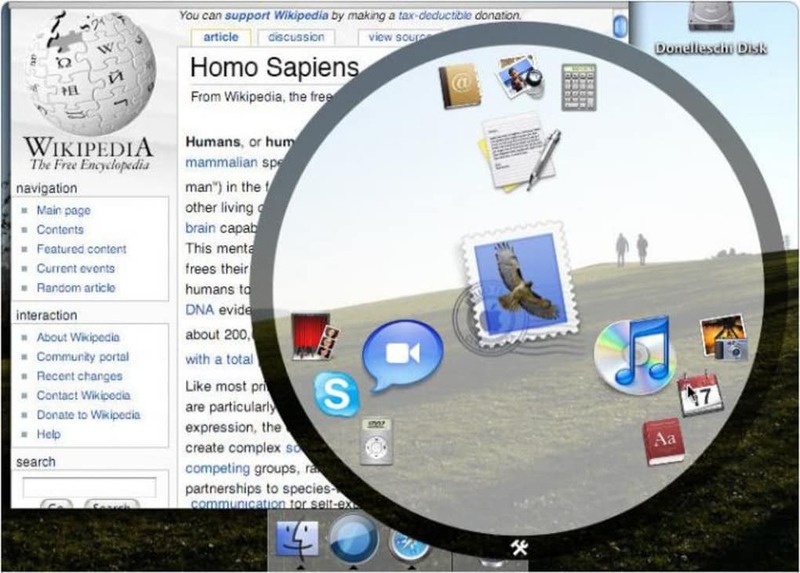 Sapiens is an application launcher that gives you quick access to anything on your Mac. The program exercises your memory by arranging applications in a certain way, which you'll become accustomed to the more you use the program. Sapiens itself has what it calls a brain saver, which effectively means the program improves the more you use it. The application launcher offers five different layout displays which which distribute applications on the interface differently. While they might seem confusing to you at first, you'll quickly see a pattern in the placement of applications on the Sapiens interface. For this reason it's best to stick to the one that you feel the most comfortable with. Sapeins provides a different yet effective way of accessing applications. Just like with Quicksilver, you can find any application by typing their name into the Sapiens interface. Your mouse's scroll wheel can also be used to quickly shuffle through applications. A particularly cool feature in Sapiens is that you only need to move your mouse in a circle to activate the program. Sapiens launches applications quickly based on an assimilating display pattern and a handy "find as you type" function. Sapiens is an application launcher, it helps you access all the applications in your Mac. Sapiens is clever because it learns from you, so unlike any other launcher it predicts the applications you will likely need and offers a visualization of this prediction in an intuitive way. Sapiens is activated by moving the mouse in a circle (yes, it is a mouse gesture that finally works), therefore touching the keyboard is really the last resort to be used in case you want to search for a specific application. Sapiens was created because we recognize that users are tired of launching applications by typing (whether by using Spotlight or any other keyboard-based launcher). These launchers make us feel like we're back in the '80's when the keyboard was the only input device. Everyone wants to have visual access to their favorite applications, but it's inefficient and frustrating to organize applications in different folders or in different docks. Life is too short, and there's not enough time to waste fighting against the entropy of the system. Sapiens the is next evolutionary step in application launchers. It is a visual tool that predicts the applications you will want to launch and lays out the application's icons in way that makes interaction with the mouse simultaneously intuitive and revolutionary. Awesome app . I saw Sapeins mentioned in Macworld and downloaded it out of curiosity and love it. Very easy to install and use allows me to be more productive by keeping my most used programmes at hand, all I need to do is make a couple circles with my mouse and I can launch a programme much faster than navigating to the Apps folder. Such a shame if it is true. My opinion of Sapiens is that it will help me be more productive. I will, with a circle motion of my mouse, be able to access applications that I use on a daily basis faster. Not only faster but also without much frustration. I sincerely hope that the snow leopard bug is fixed soon. I am sorry to read that users that have paid for this program have not received the support that they should have received. Is the developer dead or plain rude?. It's been months since Snow Leopard which killed this application. Please developer, let us know what's happening? Waiting, waiting, waiting. Great program, but ever since the Snow Leopard upgrade, it's been broken. I've paid for this program, and I expect it to work. Unfortunately, they aren't answering feedback emails, they're not answering personal requests (as a paying customer) for progress reports. Not functional with Snow Leopard, yet. It's a great program, but what's the point if you can't type to even search for a program in Snow Leopard? What do you think about Sapiens? Do you recommend it? Why?